Your financial habits play a huge role in your current financial situation and your future financial stability. There are plenty of people who are making six figures a year and they’re drowning in debt, living paycheck to paycheck. On the flipside, I know people who are making less than half that but, due to good financial habits, are financially stable and have a bright financial future ahead of them. 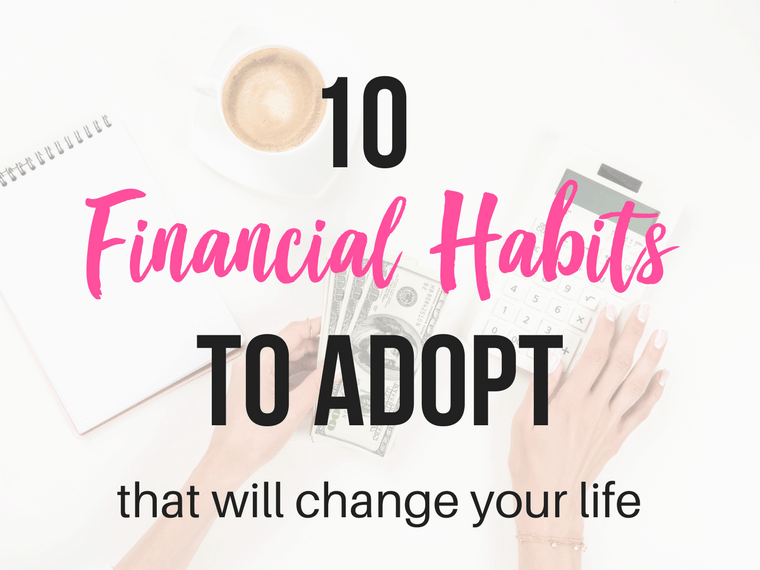 Over the years, my husband and I have adopted many good financial habits that have put us on the path to financial freedom. We’re debt-free, investing for our future, and saving for our retirement. We’ve never received an inheritance, annuity, monetary gifts from relatives, etc. And neither of us earn massive salaries. We’re in the position we’re in due to dropping bad financial habits and adopting good ones. Here are 10 financial habits that I recommend you start implementing. Trust me, they will change your life! When it comes to good financial habits, this is probably the most important – always know where you stand. Before you even create a budget, you need to know exactly what your starting point is. What is your monthly income? What’s your current net worth? How much are you currently spending every month? How much are you paying in hidden fees? It might seem overwhelming to try and figure all this out, but don’t worry. That’s where Personal Capital comes in. Personal Capital is a completely free-to-use wealth management tool that has been featured on websites like Forbes and Kiplinger. You simply input all of your details and Personal Capital gives you a complete overview of where you stand financially. Click here to get a free Personal Capital account and find out your current financial position. Once you know where you currently stand, it’s time to create a budget. A budget is an essential tool for helping you achieve your financial goals, and while it might sound restrictive and boring, I’ve found that having a budget does the exact opposite. Instead, it gives me a feeling of freedom, because I know that I will always have enough money to pay my bills, buy groceries, save money, etc., because I’ve budgeted for those things. There are a variety of budgeting apps out there, but currently, I like doing my budget the old-fashioned way – with a pencil and paper. Part of the problem is that as a society, we’ve developed a “need it now” mentality. Instead of saving up for something we want and then paying cash for it, we want instant gratification, so we just swipe our credit card instead. Avoid doing this and you’re already ten steps ahead. There are always opportunities to save money if you know where to look. For example, Ibotta is a free app that gives you cash back on your groceries (and a bunch of other stuff, too.) You get $10 just for signing up and redeeming your first rebate, so go ahead and sign up now. Additionally, if you do any online shopping, then make sure you have a free Ebates account to get a percentage of your purchase back in cash. Join Ebates here and get a bonus gift card. You might’ve heard financial gurus say that you should always pay yourself first, i.e. put money into your savings account. This is a wise habit to adopt, but it can also be a difficult one. Too often, we make a goal of saving money but then we see what we have left at the end of the month and save that. A better way to save is to set up an automatic transfer every month, on the day your pay goes into your bank account. I call this the “If it’s gone before you see it, you won’t even notice it’s gone” philosophy, and trust me, it works. Impulse shopping can be a budget killer, and it’s the perfect way to max out your credit card. Random trips to the mall because you’re bored is a recipe for disaster – so many pretty things just begging to be bought. Before you know it, a few hours at the mall “just to browse” has turned into $200 on the credit card. Likewise, grocery shopping can turn into a budget blowout if you’re not careful. A good way to avoid this is to plan your meals ahead of time and always shop with a list. If you have trouble coming up with meal plans for the week, check out $5 meal plan. If the paleo diet is more your style (or you just love meat!) then Paleo Plan has an amazing meal planning service, too. You can get your free Paleo Starter Kit here to try it out. An easy financial habit to adopt that will save you a substantial amount of money is to always pay your bills on time. Late fees can really start to add up and who wants to pay additional money to your utility company for essentially nothing. Whenever you check the mailbox, don’t just throw your mail in a pile somewhere and promise yourself that you’ll open everything later. Open it immediately and pay those bills as early as you can to avoid late fees. If you’re relying solely on social security to fund your retirement, you might be in for a shock. According this article on Forbes, social security was never intended to completely replace your prior earnings. And currently, social security will only cover, on average, 40% of your prior income. Imagine living off only 40% of your current income. Things would probably be pretty tight. This is why it’s incredibly important that you are saving for your retirement, and the earlier you start doing that, the better off you’ll be. One of the ways we’re saving for our retirement is through our Betterment account. Betterment is a robo-advisor that I’ve been using for a few years now, and I’ve been incredibly impressed with the service. One of my favorite features is the Betterment retirement planner that shows you if you’re on track to meet your retirement goals. Minimum Payment = Maximum Interest. The longer you take to pay off your debt, the more interest you’ll pay. If you want to avoid paying so much interest, start making more than the minimum repayment. If you’ve read my debt payoff tips article, you’ll know that my husband and I recently become debt-free. One of the ways we achieved this is through paying more than the minimum on all of debts. We had a loan for my husbands truck, and the minimum repayment was $160/month. Instead, we paid $650/month, saved a ton of money on interest, and paid the truck off fast. I’ve spoken about the Joneses before in my article about downsizing our house by over 50%. But in a nutshell – who cares about the Joneses? Whether is consciously or subconsciously, so much of our spending can be tied into keeping up with the Joneses. Why does it matter what someone else is doing? You do you! Instead of constantly worrying about what the Joneses have, start practicing gratitude for what YOU have. I promise you, once you stop caring about what everyone else has and start focusing on yourself, your spending will go down. It can be difficult to break bad financial habits and replace them with new ones, but your wallet with thank you for it. And once they’ve become a habit, you won’t even have to think about it anymore, it becomes a part of who you are!